In following examples, Vector Elements - Markers, Points, Lines, Polygons, Texts, BalloonPopups and a 3D model - are added by the application. For each object, the styling is defined and objects are created based on given coordinates. 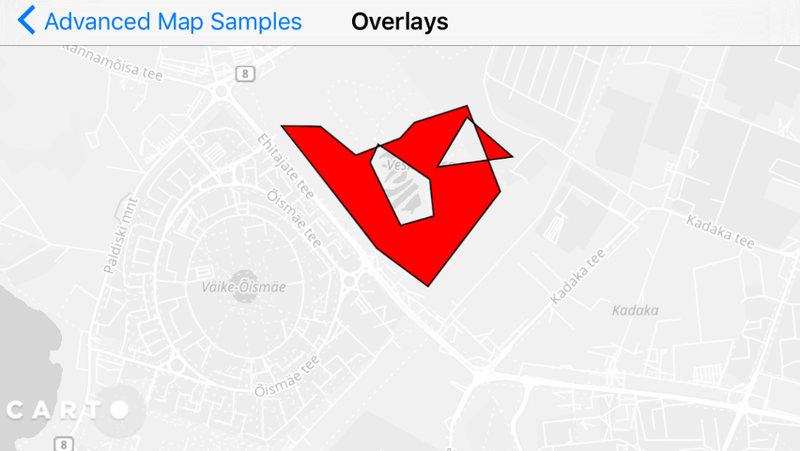 In the first example there is creatio of LocalVectorVectorDataSource object named ‘vectorDataSource1’ that is attached to a VectorLayer which is added to a MapView. Other samples do not repeat this. 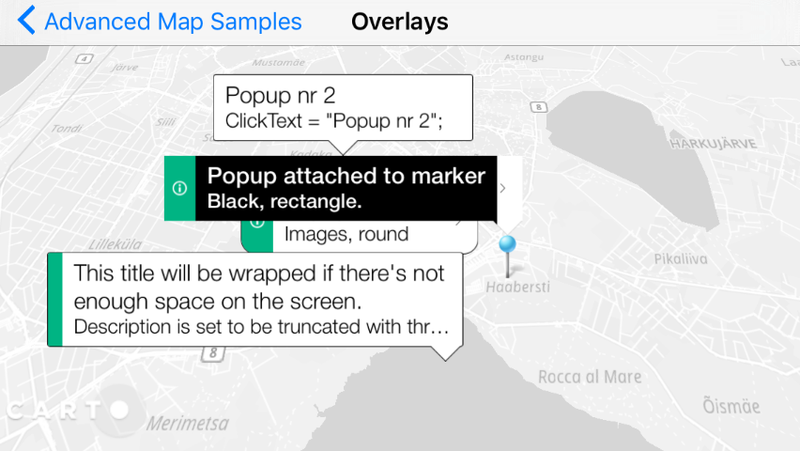 Note: A popup (callout, bubble) which appears when you click on map is a vector element of its own, and should be added using map click listener. Points are used to indicating specific location points on a map, similar to Markers. However, Points do not have overlapping controls and cannot be use with billboard style version 2.5D. If you have a lot of data (thousands of points) and are not using 2.5D views, use Points as an alternative to Markers. Your rendering time will be significantly faster. Display text as billboards in 2.5D (tilted) view by defining the OrientationMode parameter. 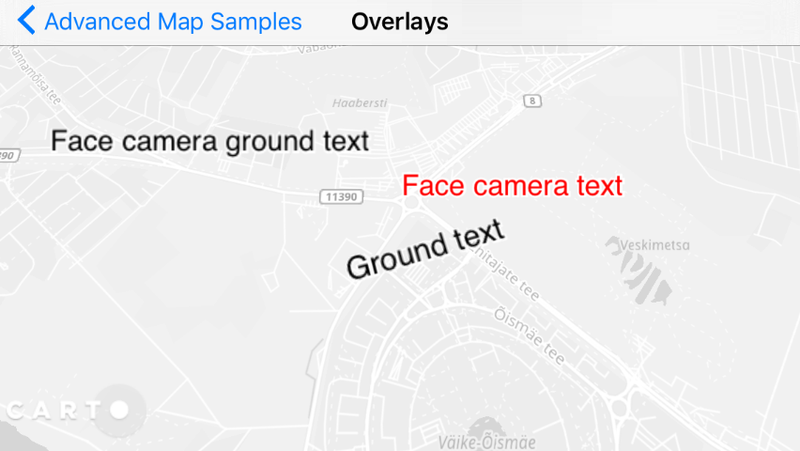 There are 3 options: show on ground, and rotate with map (like street names), show on ground (do not rotate with map), or show as billboard (no rotation). Add text and apply text styling using the following code. 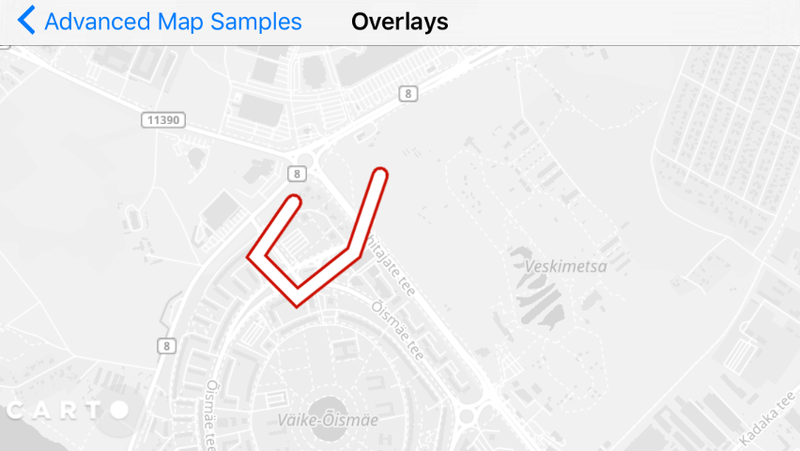 Tip: To use these styling elements as part of your own project, copy the above .png files, to your local map application project. These are in our sample apps in github. 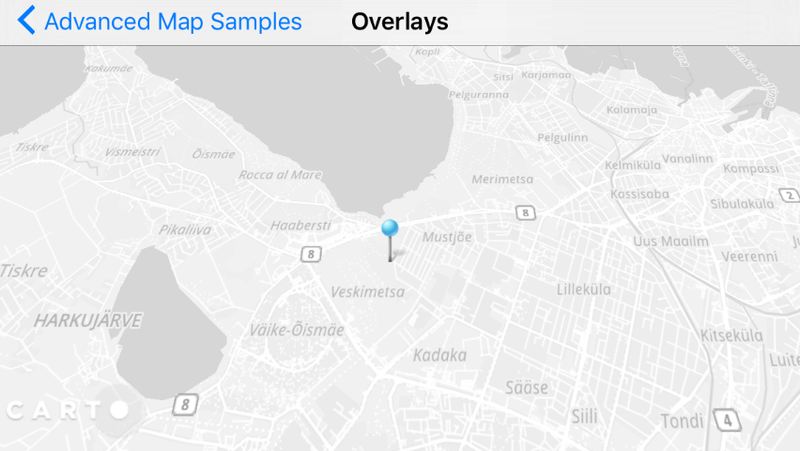 One special feature of the Mobile SDK is that you can add 3D objects (3D models) to a mobile map. For example, you can add small moving car or other decorative or informative elements. Note: 3D objects are added to the same LocalVectorDataSource as 2D objects. However, 3D objects are only supported using the Nutiteq 3D Model (NML) format. This custom format is optimized for the multi-resolution of 3D files on mobile apps. Select a NML file. You can retrieve some free samples from Nutiteq’s NML sample page. If you have own model as Collada DAE (or KMZ) format, then you would need CARTO Mobile 3D converter to convert it to NML, so it can be used in mobile. Adjust the file size of the 3D object for rendering. Typically, NML files are smaller than 100K. Anything larger than that takes too long to render. Consider applying lower detail models for your 3D objects, before you convert it to NML. You can then add these models to the res/raw folder of your Android app, or as a resource file in your iOS project.